Arch. Cant. Ds. Hardwicke, Cancellarius. The Lord Chancellor acquainted the House, "That His Majesty had caused a Commission to be issued under the Great Seal, for the further proroguing of the Parliament." The House was adjourned during Pleasure, for the Lords Commissioners to put on their Robes. Then Four of the Lords Commissioners (in their Robes) being seated on a Form placed between the Throne and the Woolsack; the Lord Chancellor in the Middle; and the Lord Archbishop of Canterbury and Lord Steward on his Right Hand; and the Lord President on his Left; commanded the Deputy Gentleman Usher of the Black Rod to let the Commons know, "That the Lords Commissioners desire their immediate Attendance in this House, to hear the Commission read." George the Second, by the Grace of God, of Great Britain, France, and Ireland, King, Defender of the Faith, &c. To Our most Dear and Entirely-beloved Son and most Faithful Counsellor Frederick Prince of Wales; the most Reverend Father in God and Our Faithful Counsellor John Archbishop of Canterbury Primate and Metropolitan of all England; Our Well-beloved and Faithful Counsellor Philip Lord Hardwicke Our Chancellor of Great Britain; the most Reverend Father in God and Our Faithful Counsellor Lancelot Archbishop of York Primate and Metropolitan of England; Our most Dear Cousins and Counsellors Spencer Earl of Wilmington President of Our Council, Francis Earl of Godolphin Keeper of Our Privy Seal, Lionel Duke of Dorset Steward of Our Household, Charles Duke of Grafton Chamberlain of Our Household; Charles Duke of Somerset, Charles Duke of Richmond, Charles Duke of Bolton, William Duke of Devonshire, John Duke of Rutland, John Duke of Montagu, John Duke of Argyll and Greenwich, James Duke of Athol, Henry Duke of Kent, Preregrine Duke of Ancaster and Kesteven Great Chamberlain of England, Thomas Holles Duke of Newcastle One of Our Principal Secretaries of State, James Duke of Chandos, Henry Earl of Pembroke and Montgomery, Philip Earl of Chesterfield, Daniel Earl of Winchilsea and Nottingham, William Earl of Essex, Richard Earl of Burlington, Montague Earl of Abingdon, Richard Earl of Scarbrough, William Earl of Coventry, Henry Earl of Grantham, George Earl Cholmondeley Chancellor of Our Dutchy of Lancaster, Charles Earl of Selkirk, Archibald Earl of Ilay, Henry Earl of Uxbridge, George Earl of Halifax, James Earl Waldegrave, Benjamin Earl Fitzwalter Treasurer of Our Household, Henry Viscount Lonsdale, Richard Viscount Cobham, Pattee Viscount Torrington; and Our Well-beloved and Faithful Counsellor John Lord Hervey Vice Chamberlain of Our Household; the Right Reverend Father in God and Our Faithful Counsellor Edmund Lord Bishop of London; and Our Well-beloved and Faithful Counsellors William Lord Harrington One of Our Principal Secretaries of State, John Lord Delawarr, William Lord Berkeley of Stratton, John Lord Carteret, and John Lord Monson, Greeting. Whereas We did lately, for divers difficult and pressing Affairs, concerning Us, the State and Defence of Our Kingdom of Great Britain and the Church, ordain this Our present Parliament to begin, and to be held at Our City of Westminster, the Thirteenth Day of June, in the Eighth Year of Our Reign; which Our Parliament from thenceforth was prorogued, by Our several Writs, until and to the Fourteenth Day of January, in the Eighth Year aforesaid, and there lately holden; and from thenceforth, by several Adjournments and Prorogations, was adjourned and prorogued to and until Thursday the Seventh Day of this Instant December, then to be held, (fn. 1) and fit at Our City of Westminster aforesaid: Know ye nevertheless that, for certain pressing Causes and Considerations Us especially moving, We have thought fit further to prorogue Our said Parliament: Therefore We, confiding very much in your Fidelity, Prudence, and Circumspection, have, by the Advice and Consent of Our Council, assigned you Our Commissioners; giving to you, or to any Three or more of you, by virtue of these Presents, full Power and Authority, from the said Seventh Day of this Instant December, in Our Name, further to prorogue and continue Our present Parliament, at Our City of Westminster aforesaid, until and unto Thursday the Eighteenth Day of January now next following, there then to be held and fit; and therefore We command you, that you diligently attend to the Premises, and effectually fulfil them in the Manner aforesaid. 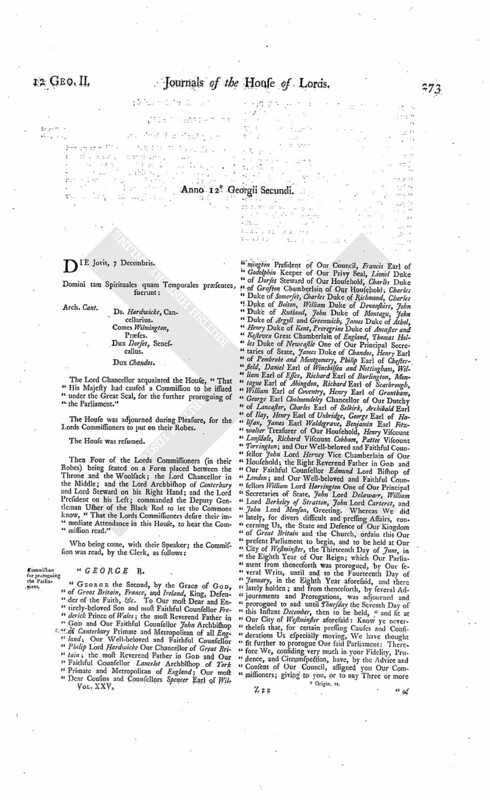 We also strictly command all and singular Our Archbishops, Dukes, Marquises, Earls, Viscounts, Bishops, Barons, Knights, Citizens, Burgesses, and Commissioners for Our Counties and Boroughs, and all others, whom it concerns to meet at Our said Parliament, by virtue of these Presents, that they observe, obey, and assist you, in executing the Premises, as they ought to do. In Witness whereof, We have caused these Our Letters to be made Patent. Witness Ourself, at Westminster, the Fourth Day of December, in the Twelfth Year of Our Reign. "By the King Himself, signed with His own Hand. 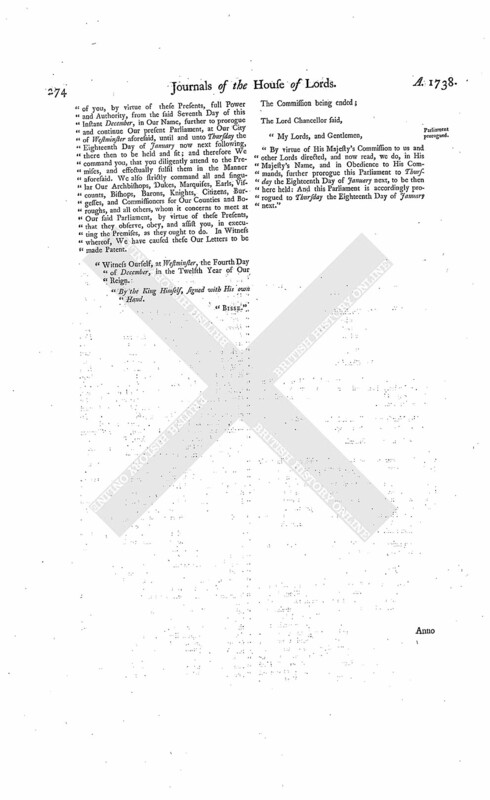 "By virtue of His Majesty's Commission to us and other Lords directed, and now read, we do, in His Majesty's Name, and in Obedience to His Commands, further prorogue this Parliament to Thursday the Eighteenth Day of January next, to be then here held: And this Parliament is accordingly prorogued to Thursday the Eighteenth Day of January next."